The Gibson RB-250 – or Regular Banjo – became the workhorse, standard instrument for country and bluegrass players after it introduction in 1954. It was built until 2010, when flooding destroyed the Nashville workshop. 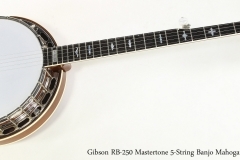 This particular Gibson RB-250 Mastertone banjo, dating to 1998 at the Gibson Nashville plant is in very good condition and appears to be entirely original. 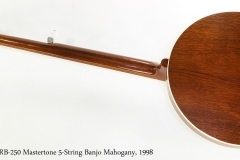 This model uses Mahogany for the rim and neck, with a bound Ebony fingerboard and peghead inlay. Naturally it has a Mastertone tone ring. The inlay set and Gibson script logo are executed in Mother of Pearl. Four capo tacks are installed. There is natural finish oxidization and checking, but very little wear, scratches or denting. This banjo has been recently set up at The Twelfth Fret and plays well. Naturally, it’s fairly loud, and has that brightly defined Gibson tone.